Cuddle Your Cakes in the Comfort of Natural Brown Cake Boxes. Brown cake boxes give your cakes a warm presentation and an added sense of value beyond what you would expect from a cardboard cake box. Maybe that's because these aren't your typical recycled cake boxes. 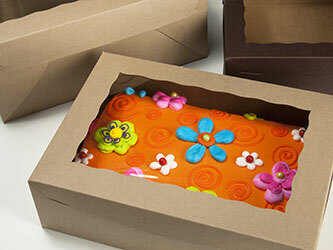 For starters, free shipping on all brown cake boxes to the lower 48 States! Our natural kraft boxes are made from virgin scrap from saw mills and even though these boxes are some of the strongest going, they use 1/3 fewer trees. You can actually see the natural plant fibers in the paperboard of the brown cake packaging because no harsh chemicals are used to bleach the material. Your chocolate brown cake boxes are printed with soy based ink and grant the rich feel of deep dark chocolate. We print and manufacture cake boxes in multiple color choices, but the organic tones of these brown cake boxes feel like home. Grab some samples from our Samples Page and see for yourself. We made special lids to fit this heavy duty base. The lids are item 3710 and 3708. We made a special lids to fit this heavy duty base. The lids are item 3884. and 3705.